On Thursday, October 18th (that’s tomorrow! ), Dennis Flannigan, a member of Puget Sound’s Class of 1961, will join us in the Archives Seminar Room on the second floor of the library for our “Behind the Archives Door” lecture series. In his 20s, rather than finishing his studies in American literature at Puget Sound, Flannigan decided to join the 1964 Freedom Summer campaign to help register African American voters in Mississippi and build community resources such as libraries. While in Mississippi, he wrote letters to his friends at Puget Sound. 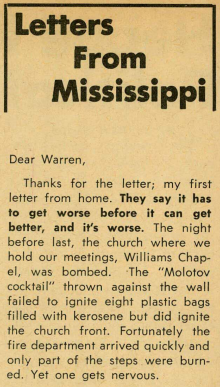 The seven letters were published in The Trail during the fall of 1964 as a series titled “Letters from Mississippi.” In these letters, Flannigan recalls the backlash against the Freedom Summer, including the bombing of the church the civil rights workers used as a meeting place. 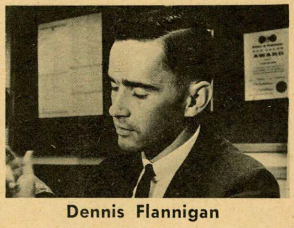 Flannigan went on to become a four-term state representative and founded or co-founded of several local organizations including the Pierce County Alliance, Emergency Food Network, and Pierce County Reading Foundation, among others. He received an honorary Doctorate of Law from Puget Sound in 2012. During this event, Flannigan will reflect on his past of civic engagement, and we will examine Puget Sound documents related to the Civil Rights Movement.